This title was first published in 2001. What impact has the National Curriculum for England and Wales had on pupils, teachers, academic and social standards in the ten years since its introduction? 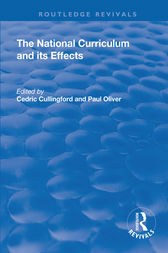 The distinguished contributors to this volume examine the history and development of the National Curriculum to date and assess its effects.